Arrow is one of the best scripted series on TV right now. The Flash has the potential to be. The obvious reason to do a double-episode crossover event between Arrow and The Flash is the stunt appeal, and likely an effort to broaden both audiences a bit. But from a series perspective, both Arrow and The Flash made the best possible use of this event, both in the way the two series contrast, and in evaluating the strengths and difference between their heroes. Two great, very different heroes working with (and against) one another. We've known since The Flash began that this is not merely a clone of Arrow set in an adjacent city, focusing on a new hero. But The Flash's "Flash vs. Arrow" and Arrow's "The Brave and the Bold" did a wonderful job of emphasizing the differences between the two series, and also the two heroes. 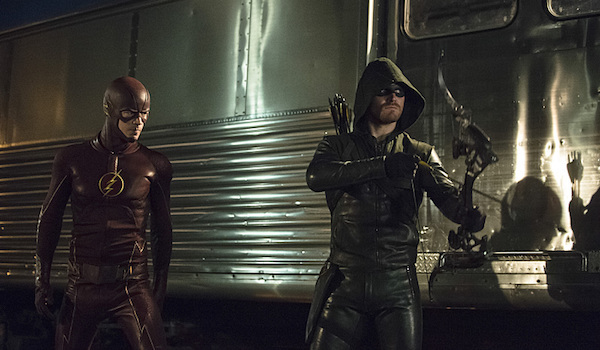 "Flash vs. Arrow" revealed that even the good-natured Barry Allen has a darker side. Sure, his Flash-rage was meta-human induced, but it's fair to say that the truth tends to come out when we're really worked up, and Barry was most definitely worked up. Whether he was lashing out at Caitlin, telling Iris off or stepping up to Oliver, the rage brought out Barry's ugly side, proving that he actually has one, and reminding us that when he's got it together, Barry Allen is a total nice-guy. Oliver, on the other hand, has the reverse issue. Well, he's not suffering from red-eyed rage, but he is concerned that his humanity is slipping. He's played this game long enough to struggle with his identity. 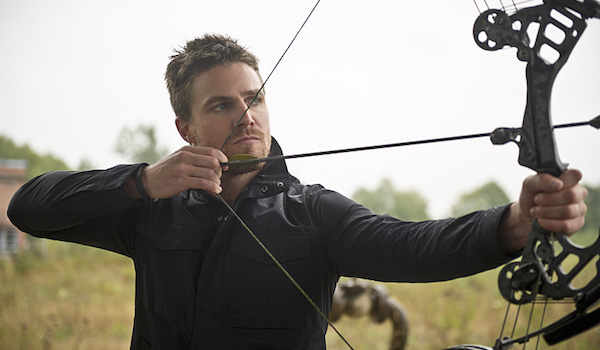 Can he be both Oliver and the Arrow? That's an open question that's constantly addressed in this series, but Barry's contribution to that dilemma at this particular stage of Oliver's life is to point out that it's Oliver's humanity that may be to credit for the hero he's become. Every time Oliver chooses to put an arrow through someone's hand or shoulder instead of their heart, he's channeling that humanity. Barry's view of things is a bit underdeveloped at this point, but that perspective was perfectly timed for what Oliver's been dealing with. As Oliver put it, "There's a difference between having powers and having precision." Barry Allen has powers. Oliver Queen has precision. 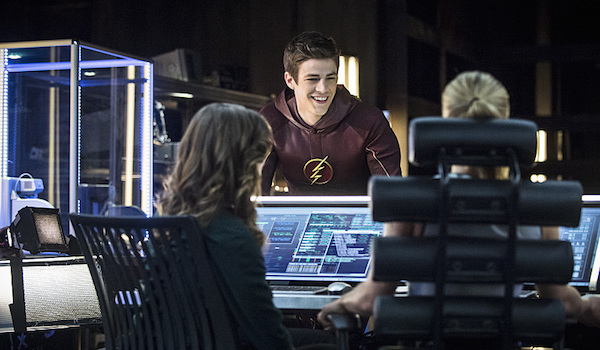 And Team Arrow has come to learn the value of precision, while Team Flash has made good use of Barry's power. But at what point does it become too easy? The crossover episodes made great use of each heroes' strengths, but they also demonstrated how necessary it is for the challenges to differ from one show to the other, in order for them to actually be challenging. Oliver may not have Barry's strength and speed, but his experience and precision allowed him to take down angry-Flash. Meanwhile, Flash proved useful in quickly putting together the Boomerang evidence, and even more so when he was able to whisk Lyla off to the hospital, and later, to zip around Starling, ensuring that a member of the combined team was set up near one of the explosives and ready to disarm it in sync with everyone else. Ok, that could've been disastrous if something went wrong, but the point is, looking at one series to the other, Starling's problems are suited to showcase and challenge Oliver and Team Arrow, while Central City and all of its meta-humans ("I'm not calling him that, Barry") are set up to challenge Barry and help develop him as a superhero and a character, and likewise for his team. The crossing heroes and shows is a fun way to see the benefits of each heroes' abilities in the others' world, but it also emphasizes the story challenges both shows face in finding a balance between showcasing the characters' strengths, challenging them on multiple levels, and never making it look too easy. Assuming The Flash is just starting out on its journey of becoming a long-running series -- fingers crossed -- we might want to bookmark these episodes as examples of who Barry was at the start of his heroic journey. That could be said for all of Season 1, but the these two episodes in particular seemed to go out of their way to showcase Barry as being the more relaxed, friendly (when he's not a rage-Flash) hero-next-door. He has the spirit of a hero on the rise, which contrasts a bit with Oliver, who has the spirit of a reformed (in progress) vigilante. In a sense, there's balance between these two characters, which comes through when we see the two series' paired. But it seems necessary to point out that -- just as The Flash is new -- Barry is still very new to the hero game, and while his optimism proved to be helpful for Oliver, his character has barely been tested. I think this came through best when Barry was trying to tell Oliver that he'd experienced loss too. He saw his mother die (and his father imprisoned for it), and that's something he's carrying with him through this journey, especially as he tries to figure out who was responsible for her death. But loss isn't the only thing that has made Oliver who he is today. The choices he's had to make and live with have likely taken their toll. Shado, Tommy, his mother, Sara... these aren't just deaths that have happened, they're part of a bigger picture that incorporates judgment calls and choices Oliver has made. It isn't a prerequisite to suffer numerous losses in order to achieve superhero status, nor do I think Barry's on the same path as Oliver, but I do expect Barry's character to evolve and shape itself the more he's challenged. At present, he has barely scratched the surface of whatever he's going to experience and the choices that come with this responsibility. We can only speculate as to what the series will put him through, but I do expect his good-natured attitude and positivity to be put to the test once he faces a bit more adversity. As Oliver put it, "It takes more than a mask, it takes discipline." Barry has more to learn about the responsibility he's shouldering and how it will affect his personal life. Both episodes did a great job of emphasizing the newness of his superhero status, while also showcasing the benefits of Barry's powers. These episodes made some interesting strides for both shows. For one thing, the secret identities of Oliver Queen and Barry Allen have been revealed to each others' teams, which should unlock more opportunities for crossovers and character drop-ins in the future. I expect that was the intention, and it was great to see the awkwardness as Lyla saw Barry just chilling in his Flash suit without his mask. Meanwhile, The Flash pumped the breaks on Iris' growing crush on The Flash. Thank you! That romantic arc probably should be paced to suit Iris' character development, otherwise her character development will end up being paced by her crush on the Flash. And then, that's who she is. And I'd rather see Barry focusing on his abilities and the challenges he's facing and less on trying to make this thing with Iris happen. The events of "The Flash vs. Arrow" may have put Iris off of The Flash, at least a little bit, could offer a bit of conflict between the two characters and will hopefully cut back on Jitters meet-ups and rooftop rendezvous. Arrow wins... but we definitely need a rematch. Flash doing the salmon ladder. Awesome. (And Cisco's attempt). Flash making a mess of the Arrow cave every time he came or went. "You get hit by a bus or something?" Putting Nick Tarabay and Cynthia Addai-Robinson in the same episode (Spartacus fans will appreciate that). "The only thing that hurts worse than an arrow going in is an arrow coming out." "Everything all right between you and Speedy?" Cisco giving Oliver the new jacket (with the hood!). Oliver giving Barry a case for his suit when he's in town. "My ex-girlfriend Oliver's Sister." Roy and Felicity. 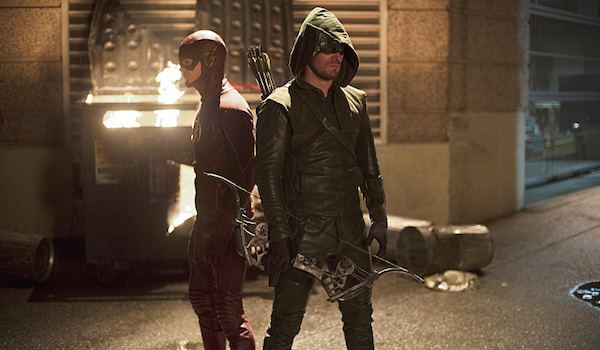 These are some of the reasons I'm picking Arrow as the winner of this Flash vs. Arrow showdown. But the truth is, a lot of the things I liked about Arrow had to do with the way it welcomed The Flash characters in and made the most of them. The Flash did that too, but as I said, the familiarity of Arrow goes a bit further in that respect. In the end, we all win though, because we got two great episodes, both of which served as an unnecessary reminder that the CW is offering up two great superhero dramas. What's more, I want to see how these two sets of characters interact with one another a season or two from now, after The Flash has a bit more wear and tear on it, and Barry's perspective on his duties and his abilities has evolved.